Many everyday objects touched by dirty hands are harbouring and spreading the common cold virus, say scientists. By analysing hotel rooms in America, researchers found that the virus was easily transferred to 35% of the surfaces touched. Door handles, pens, light switches, TV remote controls and taps were all found to be contaminated as much as 18 hours after first contact. The University of Virginia work was presented at a US science conference. People who touched the contaminated surfaces during everyday activities, such as answering the telephone or turning on the light, had a 50% or one in two chance of picking up the virus. The rate went up to 60% when surfaces had become contaminated just an hour earlier and down to 33% when surfaces had been contaminated for 18 hours. Although transmission of rhinovirus infection by way of surfaces is not as likely as transmission by direct contact with an infected person, it is important, say the researchers. Researcher Dr Owen Hendley said: "People still should understand that the virus remains available for transfer for at least one day." Rhinoviruses are responsible for about half of all common colds in children and adults. School children usually catch between seven and 10 colds a year, and adults two to five. 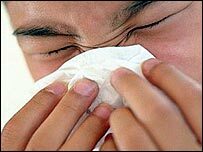 Professor Ron Eccles of the Common Cold Centre in Cardiff said: "Common colds and flu can be transmitted by hands and contact with commonly touched surfaces. "But most infections are caught at home. You need prolonged and close contact to catch a cold. And infants and children are the biggest spreaders of colds. "Children are prone to colds because their immune systems are learning to cope with them. Plus their personal hygiene is not as good. Their noses are running and mucus gets everywhere. "You can get a cold in a hotel room or on public transport but it's perhaps not as high a risk."